Tess & Duke in North Riding! We must have some very cute dogs to walk, because we got A LOT of smiles this morning from people sitting in traffic. They all seemed to cheer up immediately when they saw our little pack. Duke and Tess were first up for a walk this morning, and were very excited to be having an adventure with their walkers and friends Ozzy and Roxy. Duke the Pit bull joined the pack later on (have a look here for more on his walk), which was nice for everyone to be able to socialize. It started off quite cool, but warmed up a bit while on the walk, as the sun came up and we worked up a bit of a sweat. North Riding was very busy this morning, but the dogs didn’t seem to mind. Lots of pedestrians were very interested in Duke and Tess, but kept their distance a bit. The pair were initially very full of energy, but walked very nicely together to expend it. They were very curious today, and found lots of new interesting smells. On the way back home, we encountered a dog without a leash who was not happy about these dogs, but Duke and Tess behaved very well, keeping their composure until the owner of the other dog could get their leash on. What lovely pups! Duke and Tess really enjoyed their tour of North Riding, and we look forward to seeing them next time! 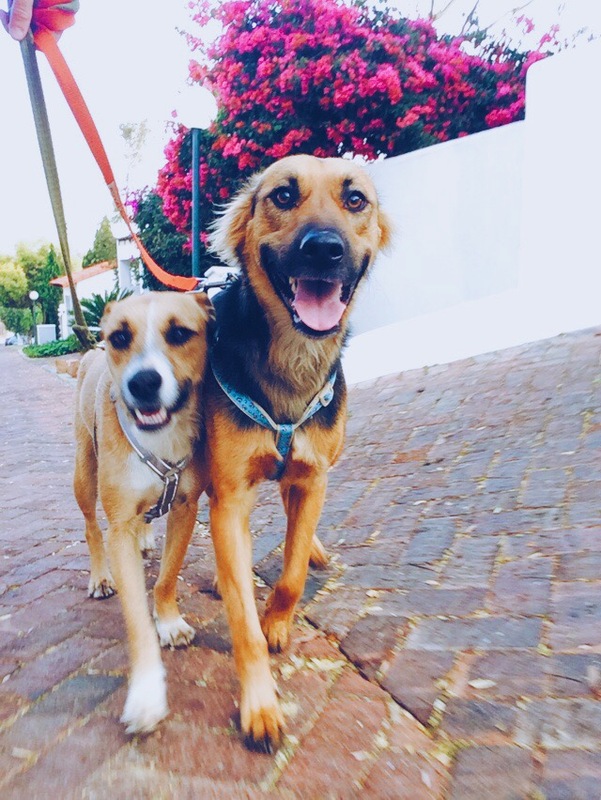 This entry was posted in Dog Walking and tagged #YourHound_SA, animals, city streets, Dog walking, dogs, Early mornings, fit, Happy Dogs, Johannesburg, Pets, Socializing. Bookmark the permalink.